Practice Presentation Rooms offer the same equipment as other technology-smart classrooms on campus, a projector, podium and computer, and help students gain experience and confidence with public speaking. 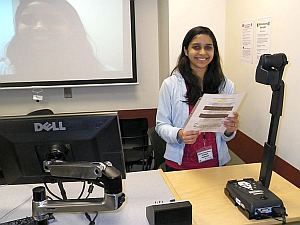 To review your presentation, use the attached document camera to create an AVI file, and save directly to your USB flash drive. Playback is limited to video-only unless the file is moved to the computer where full audio and video playback is available. The document camera cannot be used as a webcam for Google Hangout or Skype. For help with video recording or conferencing, check with Technology Help (2nd floor) or the Circulation Desk (1st floor).